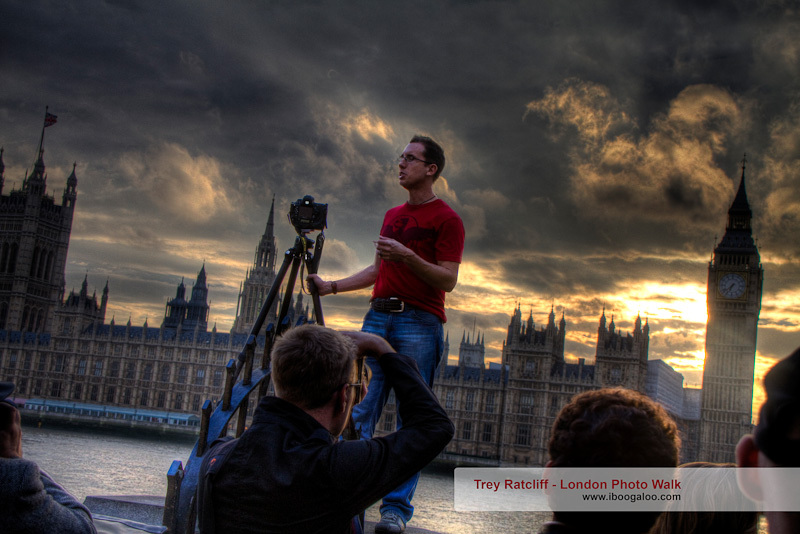 iBoogaloo Photography » Trey Ratcliff HDR Photowalk – Westminster, London. Come from Trey’s site? Scroll to the bottom and leave a comment to say hello! 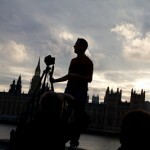 I took advantage of Trey Ratcliff’s invitation to join him for a photo walk while he was in London last Friday. Trey is the leading name in HDR photography and has taken the process from the oversaturated, overprocessed method that people all too often misused to make an average shot look better, to getting HDR photography into the Smithsonian. Yes, Trey Ratcliff had the first HDR photo ever to hang in the Smithsonian. A significant result for Trey, but also for HDR photography and for everyone who appreciates it. I’ve messed around with HDR photography, and went through a phase about a year ago when I made it a specific goal to take a couple of HDR shots every time I took my camera out with me. I got Photomatix Pro and I read through Trey’s HDR tutorial as well as a lot of other people’s notes, comments and guides. The thing that got me excited about what could be achieved was learning that the development of the HDR photo is a process that includes Photoshop as much as it includes the specialised HDR software, Photomatix Pro. Until I fully realised this, I was never happy enough to show anyone the HDR results I was producing. My shot of Trey shows him standing on the wall on the South Bank of the Thames and literally “preaching to the converted” with his tips and advice for getting the scene in front of us into a decent HDR shot. I was trying to do two things at once. 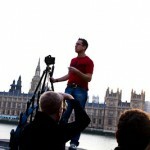 There were about 75 other people following Trey around on his free London Photo Walk, and we all had tripods. I was trying to listen to the tips and advice he was giving, but I was desperately trying to fight for a little bit of tripod space to get a shot of Trey on his podium. I couldn’t splay the legs of the tripod fully, there were that many people around, but, I got my shots. Even as I was setting up the camera, the advice Trey was giving right there and then was used to get the shot. “Shooting into the sun like this I would go from -3 to +3”. That’s exactly what I dialled in for these three shots. The next issue about getting the final result is that Trey is quite an animated guy. He is calm and tranquil (he describes himself as an old school gentleman) but clearly passionate about photography, and most importantly to me, photographers. He had time for every one of us during the 3 1/2 hours he wandered around London with us. But getting and HDR photo of an animated speaker like Trey requires the extra development time to work with the changes in position or ghosting that occurs over the three separate images. This was where I was able to use the Photoshop processing I had practised last year to improve the results that Photomatix had created for me. And I’m glad I took the extra time (most of my Saturday morning) as Trey chose the shot to put on the front page of his blog, http://www.stuckincustoms.com. Were you there? Have you been on a photowalk with Trey elsewhere? Are you following Trey’s blog and HDR procesing yourself? Please, took a moment to leave me a quick comment, or, take 10 minutes and leave me a long one. Give me some links to other photo walks you’ve been on, or to some of your HDR images. I’d love to hear from you. I was in London the day before, weather was awful and no chance of getting any good photos. Really like the end result int he photo of Trey, glad to see he has put it on his website also. 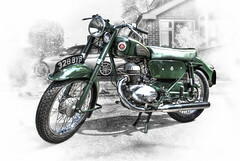 Be interested in what post processing you have used on it as the effect is really good and it works. Dan, I processed the three images through photomatix, then I took the correctly exposed version of the shot and tweaked its exposure in Lightroom so that it was more contrasty and matched the HDR image produced by photomatix. I imported both the HDR and the tweaked correct exposure image into Photoshop and blended the image of Trey from the correct exposure image over the top of the HDR one so that Trey gets to look at least semi natural. Then, I set the opacity on the image of Trey to 80% so that you could see some of the HDR Trey coming through so that Trey and the HDR image blended better. Great photo! I’m in love with the clouds. I was directed here from Trey’s blog and just had to leave a comment. Also, thanks for the explanation given in the previous comment. Nice shot, Stephen. Only thing I would have done different would have been to brighten the image of Trey, after all shouldn’t the “God Father” of amateur HDR photographers be depicted with an angelic glow around him? I agree with you Wayne, but I’m usually spending all of my time processing HDR photographs trying to get rid of the angelic glow that appears around objects. I do agree that the whole image could do with a bit of lightening, particularly Trey. Great photo of the man himself, as has already been said, I think Trey himself could do with just being brightened up. I have been following Trey for well over 12 months and am a very keen amateur HDR photographer. Don’t like calling myself a photographer, because it sounds as if I’m good and I don’t think I am. Would have loved to gone on the photo walk, but living up here in the north and with work commitments meant I was unable. Thanks for the video it looked like fun. I actually like the background best of all, it has a lovely smooth and natural pencil drawn look to it. Exactly, Graham, where is that angelic glow when you really want it. As a kid, I followed Neil Davis’ work. While the photograph quality was not there by comparison todays work, the compositions always were. I’ve been following Trey’s work on Facebook for almost a year now. While I am not a photographer, I understand the medium well enough to know instinctively that his work is ground breaking and it is an honor to see it unfold. I’ve actually been after him to do a coffee table book. Thank you for sharing your insights on the experience, the video and the blog! Well, for me, the first time I took an HDR photo I was hooked…but after doing it for awhile it quickly lost its charm and today I’m using HDR in only about 1 of every 20 landscape photos I take and even then I only blend about 10% of that HDR photo with the other single exposures. To me, 2-3 frames of a landscape is more than enough when using a quality Lee ND grad filter and proper blending techniques in Photoshop…HDR is pure phart IMHO. Thank you very much for making the video of Trey’s London walk. It gave a very interesting insight for those of us that were too far away to participate on the day. Roy, I go through phases with my HDR photography too. As I said earlier, like you, I was mad for it when I first tried it, but more recently, I only use it for those circumstances that really benefit from it (or when out specifically following HDR photographers!). It definitely gets mixed reactions. Most non-photographers I show my shots to are always blown away by HDR, most photographers are critical. I like it, when it is done well (or done the way I like it I guess) and I’ll keep at it when the right circumstances apply. Michael, thanks for the comments, looks you were in Trey’s hometown, Austin, Texas when Trey was over here. 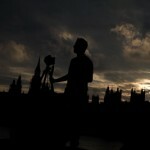 Great shots of Austin on your blog and I know what you mean about the “Tripod Police”. One of the things that I was most interested to see on Trey’s photo walk was where he went with his tripod. Carrying a tripod in England is like carrying a banner saying “Over here Mr. Policeman, harass me.”. I’m a photographer, not a terrorist.